by Whitman, Michael E., Mattord, Herbert J.
Whitman, Michael E., Mattord, Herbert J. Explore the field of information security and assurance with this valuable resource that focuses on both the managerial and technical aspects of the discipline. 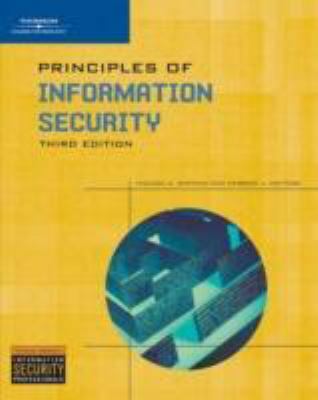 Principles of Information Security, Third Edition builds on internationally recognized standards and bodies of knowledge to provide the knowledge and skills that information systems students need for their future roles as business decision-makers. Coverage includes key knowledge areas of the CISSP (Certified Information Systems Security Professional), as well as risk management, cryptography, physical security, and more. The third edition has retained the real-world examples and scenarios that made previous editions so successful, but has updated the content to reflect technology’s latest capabilities and trends. With this emphasis on currency and comprehensive coverage, readers can feel confident that they are using a standards-based, content-driven resource to prepare them for their work in the field.Whitman, Michael E. is the author of 'Principles of Information Security, Third Edition', published 2007 under ISBN 9781423901778 and ISBN 1423901770.